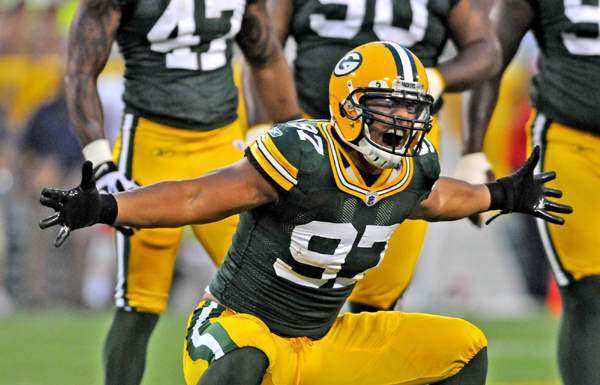 Packer outside linebackers alone had 21.5 QB sacks in 2010, their Super Bowl championship season. In 2011, that number dwindled to 12 and half of those belonged to Clay Matthews, or CM3 as he is often referred to. Beyond Matthews, there was little production from the OLB position and the Defensive line didn’t help much either. That lack of pressure put an extra strain on defensive backs who had to hold their coverage while opposing QB’s had virtually all day to throw. It caught up with the team at the worst possible time, in the playoffs, and the Pack were one and done this past January. Heading into this season, it was obvious the Packers defense, led by Defensive Coordinator Dom Capers, would need to find a way to get more pressure on the passer. The Packers selected DE Nick Perry, USC, with their 1st round pick in this year’s draft. 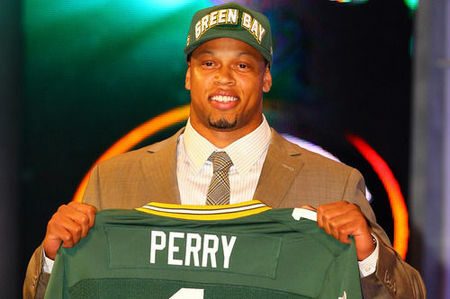 Perry had been rumored high on the Pack’s draft board and many experts had him to Green Bay in their mocks. 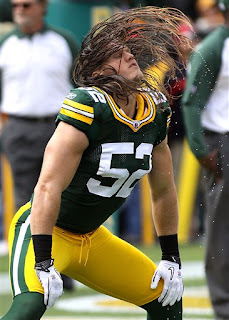 The idea was that he would convert to OLB and play opposite Clay Matthews in the 3-4 base defense. Perry’s scouting report tells the tale of a player who played 3 seasons at USC, 9 of which came during his red-shirt freshman year. He’s athletic with the ability to cover the pass and play in space. He has an good initial burst off the line and is strong. He came to camp down 9 pounds and weighs in near 267 lbs, a more ideal size for an OLB. Part of the Pack’s plan to capitalize on Perry’s strength and size is to put him on the left side, which most teams favor on running plays. During OTA’s and over the past 2 days of camp, Perry has been nearly attached at the hip to Matthews, soaking up as much as he can about the nuances of the defensive scheme. He appears to be a hard-working player who relies on his speed and agility to get to the QB. The downsides of Perry are that he sometimes doesn’t play to his actual strengty. He relies heavily on his initial burst at the snap and lacks a counter move that can shed a block and create pressure. He will have to work on his hand work, much like Matthews did, in order to disengage blockers and give him leverage to win his 1 on 1 matchups. We will monitor Perry throughout camp but he’s an obvious lock on the team and as of now, is the starter at ROLB in the base 3-4. The other certainty is Pro Bowl OLB, Clay Matthews III. His sack total was down from 2010 to 2011. He wasn’t in the backfield nearly as much as he was the year prior when he was a 1st team All Pro. The simple reason is that, as a result of his dominant 2010 numbers, he faced constant double and sometimes triple team blocks. This was coupled with a virtually absent pass rush from any other source. The departure of Cullen Jenkins in free agency was a factor as was the fact that the team was thin at D line and the starters logged many more reps than are ideal. The Pack did get creative and had CM3 in coverage at times. This was successful on a few occasions, most notably his interception of Eli Manning during a December game in New York. Matthews snuck in front of his man, grabbed the pick and was off to pay dirt. His motor never seems to stop. Plays that are well down field usually end with him somewhere near the pile. His athleticism is something to savor. He has also stayed relatively healthy, fortunately for the Pack. With Perry and the addition of 2 D linemen in the draft along with DE Anthony Hargrove (suspended 8 games) via free agency, CM3 should get some ideal matchups to help him wreak havoc on opposing passers. With his move back to ROLB, Matthews will often go up against the opponent’s left tackle who are typically the best blockers. This may seem like a questionable move but it will likely create more 1 on 1 matchups which Matthews has had much success with in the past. He has learned to effectively use his hands at the snap to disengage blockers and motor around to create pressure. The team will need more production from him this year in order to help improve the overall defense and get them off the field. 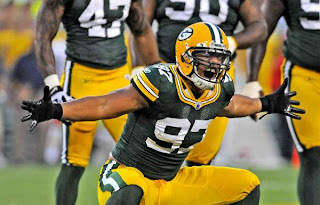 Regardless, going into 2012 there is no question Matthews is the team’s best defensive player. As for the other OLB’s, there are quite a few question marks. Reporting to camp were last year’s starting ROLB Erik Walden along with Frank Zombo, Vic So’oto and recently-signed UDFA Dezman Moses. Walden started nearly every game last season but was largely ineffective and disappointing after being such a key part of the team’s postseason success the season before. Watching him play, he seemed to lack any ability to get off blocks and make plays. He was often single blocked and teams didn’t have to account for him on the field. This allowed them to focus on other areas and neutralize the team’s pass rush. An off-field incident with a girlfriend in November last year did not help his stock with the team either. It was just announced that he will face a 1 game suspension for this violation of the NFL’s personal conduct policy. Despite that, Walden is a serviceable OLB but he is clearly not starting material. While I think he’s most likely to stick in this group, I won’t be surprised if he isn’t on the team either. Frank Zombo had an extremely disappointing 2011 season. It began with an odd injury to his shoulder blade that he suffered during warm ups in a preseason game. Once back, it wasn’t long before he suffered a knee injury among others that kept him out off the field. With such a spotty 2 year history, I’m predicting that Zombo is in camp to do nothing other than push the others. I’ll be surprised if he cracks the final roster. So'Oto made himself known last year vs. the Kansas City Chiefs. Vic So’oto is an interesting story. He emerged at the end of last year’s preseason with a monster showing versus the Chiefs. While it was a preseason game, he certainly turned the heads of both the fans and coaching staff. He was kept after the final cut down but was immediately shelved when he hurt his back during a weightlifting session prior to week 1. Fans were clamoring for him to return and relieve the lackluster Walden but the coaching staff felt he had some work to do in refining his game on top of rehabbing his back. As is often the case, Coach McCarthy was smart with So’oto and gave him adequate time to heal. With the team undefeated and winning, there was no rush. He played sparingly through the latter half of last season and saw a fair amount of reps in the season finale versus Detroit. Because of his potential, So’oto has a decent shot to stick this year but he will have to remain healthy throughout camp and prove that he can stay available. He will also face some fierce competition from undrafted free agent Dezman Moses. Moses was signed as an undrafted free agent out of Tulane just prior to OTA’s in May. He promptly made a good showing in practice and was even taking reps with the first team when Matthews was resting. His high-paced motor and ability to shine at just the right moment had everyone buzzing about this little-known OLB. Ironically he had his best practice sessions during media practices so he received plenty of coverage and attention. He even surprised some of his veteran teammates who were accustomed to a slower pace during the OTA’s. When asked about his intensity, Moses shrugged it off and simply said he had no choice if he wanted to be back for training camp in July. Here we are and Moses is still expected to keep things interesting at OLB once camp breaks in about a month. It’s possible that Moses may end up on the practice squad but as well as he has showed in the short amount of time, the Pack would then be risking another team swooping him up. I predict they find a spot for Moses and get him some reps on special teams. Whoever remains along with CM3 and Perry will all have the daunting task ahead of them of making a dramatic improvement from last season. This group will play a vital role in helping the entire defensive unit take another step towards a championship season.